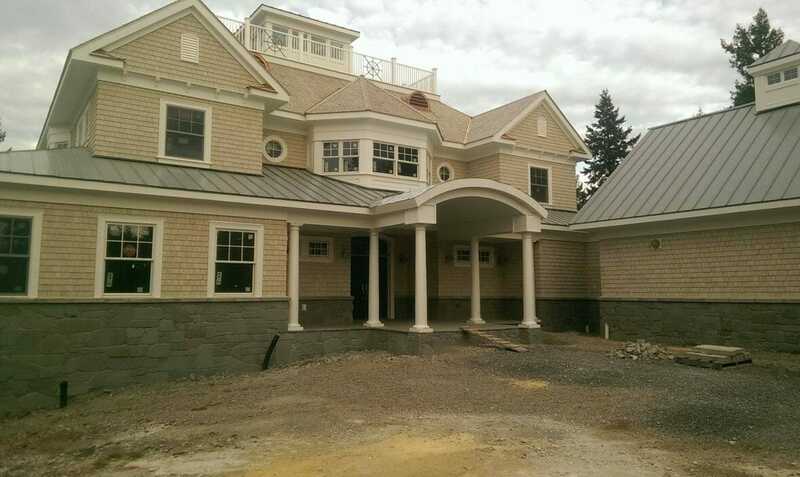 Cedar Shakes – Cedar Shingles Siding – Cedar Roofing / Tagged "Eastern White Cedar shingles"
Most people know Eastern white cedar shingles because of the way they weather to a pleasing, uniform Cape Cod grey finish over time. Originally used for the siding and roofs of well-to-do vacation homes along the New England coast, it was the preferred material to protect homes from the frequent winter storms because of the natural oils and tannins that repel water and resist decomposition. Today, the trees are harvested from sustainable tree farms in New Brunswick, Ontario, and Maine but mostly they come from Quebec where milling cedar for shakes and shingles has been done for generations. This type of wood is prized for its high durability and long life when properly installed so it can be very economical but also beautiful. It possesses a natural resistance to decay and insects which means it's also a modern, green alternative to man-made materials. Some installations of Eastern white cedar have been known to last for 50 years or more, growing more charming and elegant as time passes. Naturally low-maintenance, white cedar shingles and shakes require minimal care to look and perform their best for decades. Historically, Eastern white cedar was used most often due to the higher cost of Western but also because it weathers more uniformly as opposed to the varied shades of Western Red Cedar. Kiln-dried, white cedar is more suitable for paint or stain applications because it absorbs finishes easily and deep into the grain. Long considered a premium product, careful preparation and installation will increase the curb appeal (and resale value) of any home that benefits from a rustic informality. The “shingle style” can be used to accentuate a wide range of architectural designs including Victorian, Nantucket, Craftsman, Shed and many more. The silver-grey weathered finish looks particularly attractive with glossy white trim which is a clean opposition to the raised grain and provincial finish of the wood. Some architects pair cedar shingle homes with stone clad foundations because the textured randomness of both materials is complimentary. Direct Cedar Supplies manufactures re-butted/re-jointed Eastern White cedar shingles for your siding and roofing projects. Our skilled craftsmen ensure that every shingle is trimmed and planed so all four corners are square and even. This attention to detail means that shingles fit tightly together for a superior finish and durability.